Indigenous elders from Asia, Africa, Europe and the Americas share a prophecy for the betterment of our lives as individuals and as one relation through four sacred gifts: The gift to forgive the unforgivable, the gift of unity, the gift of healing, and the gift of hope. Understanding these gifts will illuminate your true purpose, heal your past, deepen your relationships, and help you become a powerful source of inspiration and leadership for the well-being of all humankind. Heart-stirring, hope-kindling, deeply inspiring, and always loving, Anita conveys four invaluable gifts from our indigenous elders and a treasury of spellbinding stories of the gifts transforming lives. Powerful wisdom delivered with loving guidance by a brilliantly courageous, far-sighted messenger. With reverence and beautiful guidance, The Four Sacred Gifts is a book that will allow you to set yourself free to live your most successful life. Anita helps us remember who we are so we can open our hearts to true abundance: the intimate interconnection of all life. This is the book to learn how to forgive, to heal, to unite with all life, and to revitalize hope. This is a moment in time, full of crises and accelerating change, when we most need wisdom that is rooted in the knowledge of our indigenous mothers and fathers. These four sacred gifts from the elders have the power to change lives and heal communities. With deep personal courage and brilliant insight, Anita Sanchez leads the way. No remedy is more needed in today’s confusing and seemingly chaotic times than the power of simple wisdom. In this beautifully written book, Anita Sanchez draws on her own moving and revealing life experiences to present four gifts of indigenous wisdom that can help us heal ourselves, our communities and our broken world. Anita holds a bright light and ancient mirror up to our true nature, inviting us to recognize and resonate with the wisdom of Elders worldwide, and the Four Sacred Gifts described so clearly in these pages can bring such powerful healing into our lives. She offers us her most practical and valuable methods, stories, and truths that carry a vibration of peace that I believe will ripple into waves of compassion in unexpected and delightful ways. 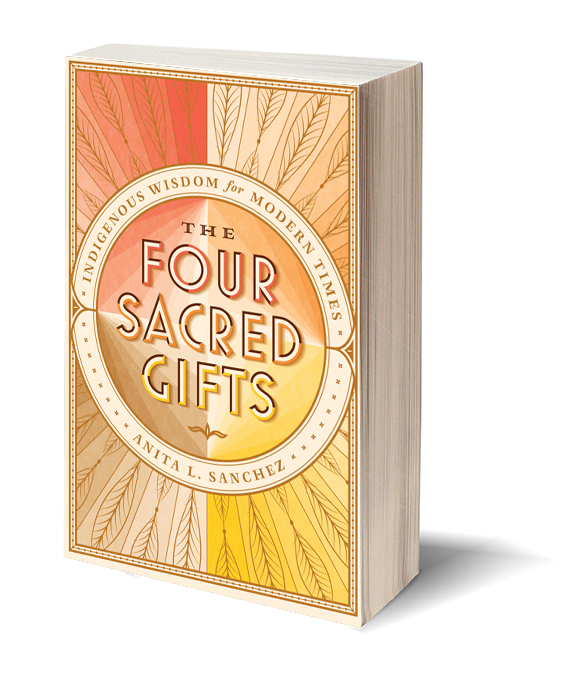 In The Four Sacred Gifts: Indigenous Wisdom for Modern Times, Anita Sanchez extends a gentle, yet compelling, hand of invitation from our indigenous Elders to renew our connection to ourselves, each other, and all life on Earth. The simple beauty, kindness and wisdom in these teachings and stories are a song, a hymn, a chant, a lyric that drifts quietly into our hearts and lies waiting to be embraced. The Four Sacred Gifts may be one of the most important books you will read in these times. With heartful generosity and authenticity, Anita Sanchez shares timeless indigenous wisdom using a simplicity and depth of language that resonates with this wisdom. In a time of ecological, social and political crises, Anita reminds us what we need is not a new story, what we need is to remember the old story, still present, if often hidden, within everyone’s heart. The Four Sacred Gifts will gently guide you in remembering. Not since Don Miguel Ruiz has there been such a powerful book! A beautiful transmission of vital indigenous wisdom for our times. This book brings the understanding of our essential unity with all things to heal the challenges of our modern lives. These gifts from the elders, wrapped in stories of courage, resilience, and inspiration, are a treasure to immerse ourselves in, and to pass on throughout the world. A must read for anyone wanting more from life. A riveting read filled with relatable stories and ancient wisdom, it’s obvious that Dr. Anita Sanchez put her life’s work into this masterpiece. A must-read primer for anyone considering indigenous wisdom written for modern times…This well-crafted volume provides strategies taught by The Elders, stories passed down to Dr. Sanchez by those who came before her, as well as her own stories using these principles in her life for great good. As the book so aptly illuminates: ‘You and I—we are the ones fulfilling the prophecy.’ This book is a goldmine! It will transform how you choose to heal and awaken in these changing, modern times. 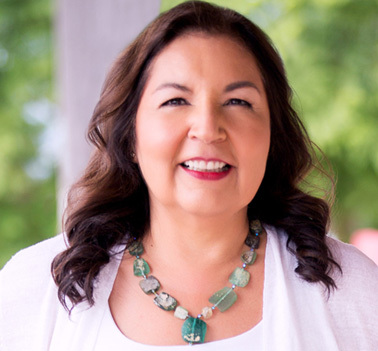 Anita Sanchez is a master storyteller while offering a unique blend of lessons deeply rooted in indigenous wisdom…By the end of her book, she had taken me through my own personal transformation journey. Such is the power of her writing. In her exquisite book, Anita Sanchez makes an offering to us of the Four Sacred gifts that were given to her by her Elders. Though her own insights and personal stories, she brings to life the power and critical relevance of indigenous wisdom to our times. If you care about the state of the planet, if you are moved by injustice and the all the ways we humans cause suffering to ourselves and others, The Four Sacred Gifts offers the message and good medicine we need to lead a life in balance and help leave a better world for the coming generations. Dr. Anita Sanchez reveals how ancient indigenous wisdom can transform us today by helping us find our true purpose, heal past hurts, and create deep connection. Anita’s voice resonates with authenticity and power. Her stories are rich and full of soul lessons about courage, resilience, and vision. The indigenous gifts offered here take us to higher ground: Forgiveness, healing, unity, hope. This is the medicine that we, and our entire society, have been craving. A true antidote for today’s world of indifference and greed! The Four Sacred Gifts will leave you feeling inspired and prepared to immediately begin making a difference from the inside out. Anita Sanchez and The Four Sacred Gifts are a gift to the twenty-first century. Heart-felt, heart-wise, steeped in indigenous wisdom and embodied with her personal stories, The Four Sacred Gifts is a treasure map that illuminates the territory that needs to be reclaimed for us to find our way back to our full humanity. The Four Sacred Gifts is a master guidebook to heal and inspire the reader into a new way of life. We can no longer live as islands: we need to rediscover what our ancestors always knew–that we are one! And Anita is the perfect teacher to guide you in that journey as she embodies the indigenous wisdom of her elders. This wonderful book is a treasure to read and a fountain of knowledge to explore. Dr. Anita Sanchez has written a soul-opening book with prose as light as a feather that reads like a warm embrace. More than just a a good book, The Four Sacred Gifts awakens an inherent memory of how good it feels to be in connection with ourselves and the world. Anita Sanchez weaves deeply personal stories while offering powerful prescriptions for transformation. Filled with indigenous wisdom, this book is remarkably timely and is a healing balm for individuals and the world. Anita Sanchez’s soulful new book is interwoven with inspiring stories of life trauma, resilience, and personal reinvention that carries us toward a new sense of possibility for our own lives and humanity. The Four Sacred Gifts beautifully describes how, together, we have the power to create a culture and world with dignity for all. The simplicity of the means to do this rings true, as do Anita’s stories of courage, strength, and inspiration. Now is the time to embrace these gifts for ourselves and the world. Enlightening, illuminating, and inspiring. A gift for generations to come. This book is powerful, accessible, poignant, raw and earnest. Dr. Sanchez offers us life lessons that give us permission to be vulnerable, to be imperfectly human. A sacred text that shows the true gift is you. Dr Anita Sanchez takes us back to a place of re-membering, where we can become members again of nature, our own authenticity, each other’s communities, and Life itself…It is not too late; the time is perhaps riper than ever for an inner journey to outer success…I have witnessed the transformational power of Anita’s message in action. This is not “whoo-whoo.” Our souls yearn for the medicine in The Four Sacred Gifts, whether we can articulate it or not. Partake of this sacred feast prepared with love. This sacred, compelling and inspiring book is itself a profound and priceless gift to humanity. Anita Sanchez’s courageous journey into her own heart of darkness and then into the light of love and perennial/ancient wisdom is a beacon and a guide for a thriving future. Anita has ingeniously woven her own story, often drawn from her remarkable heritage, with stories from indigenous elders from all over the world. A story of hope, and a pathway to the world we are waiting for. The Four Sacred Gifts liberates us to heal from the inside out and rediscover our deep connection to all life…A powerful journey awaits you here, one of courage, resilience, vision, inspiration, and faith in your own power to live a whole and purposeful life. Immerse yourself in this wisdom and share your new, greater self with the world. “Anita Sanchez has deftly and seamlessly woven her personal stories and those of the communities she has served into this explication of the four indigenous sacred gifts she was given over 20 years ago. It is a book to be savored over and over, and to be taken into one’s heart. The Four Sacred Gifts is a beautiful answer to why so many people feel separate, alone, and afraid, and how to get back naturally and easily into harmony, connection and love with ourselves, nature and each other. I highly recommend reading and processing all the wisdom of The Four Sacred Gifts. Imagine having the power to forgive the unforgivable, to heal from old wounds and to rediscover hope. This is the courage lovingly offered in The Four Sacred Gifts. Dr. Anita Sanchez’s wisdom will deeply nourish your soul. I highly recommend. We are at a true crossroad in our humanity – each of us must choose to be part of the nightmare or the dream of this lifetime. Anita Sanchez’s gift of The Four Sacred Gifts, is a pathway to living the dream. Sacred gifts await you in the pages of this delightful book. A beautifully written and engaging read, this book is filled with wisdom that you can apply in all areas of your life right now. Never has the world needed indigenous wisdom more than it does today, and I can’t think of anyone better to share it than Anita Sanchez. This book is a healing, transformative gift to the world. The Four Sacred Gifts shows us how to heal and to live more completely – it’s exactly what is needed in these challenging times. I strongly recommend it for anyone who is looking for a better way to live. A transformational journey that will inspire and awaken the parts of your soul ready to be encouraged for healing and integration of your shadow. Pulling from ancient teachings and modern philosophy, your life will shift from this potent wisdom into one of inspiration and contribution. Now you can download, for FREE, the beautiful song inspired by the messages in the book and get updates from Anita! Dr. Anita Sanchez, a powerful visionary woman of Mexican American and indigenous Aztec heritage, who has for over thirty-eight years woven indigenous wisdom, business, and science into her global consulting and training with world and corporate leaders and their teams. She also guides journeys into the Amazon rainforest with the Pachamama Alliance to support business people and their families to learn about their connection to Spirit, earth, and indigenous people, as well as build understanding of the importance of preserving indigenous cultures for us all. Watch Anita and Joel Roberts as they discuss forgiving the unforgivable and choosing hope.